On the road, can’t make it inworld. So I did something as good – I met up with SL friends in “RL”. Erev AH5B I had dinner with Dale. Lovely lovely time – great food, great ambiance and wonderful company. 🙂 Tonight I had dinner with another friend I met first in SL. M is no longer inworld but we stay in touch. I was within an hour of his location today so we met for dinner. Again – a wonderful wonderful time. We’d not seen each other in at least 2 years. We talked and laughed and reminisced. So in a very real sense – I WAS in SL for AH5B. When I got in my car to drive home, Green Day’s “Time of Your Life” was playing on the radio. I thought it quite apt. Since I have no SL photo to share, I’ll share the music. I’ll also share my thought: I wouldn’t trade away a single moment of my SL time. It’s been 5 amazing years. I’ve grown, learned, laughed, hurt, loved, lost, lived. I’ve integrated my SLness into my RLness. 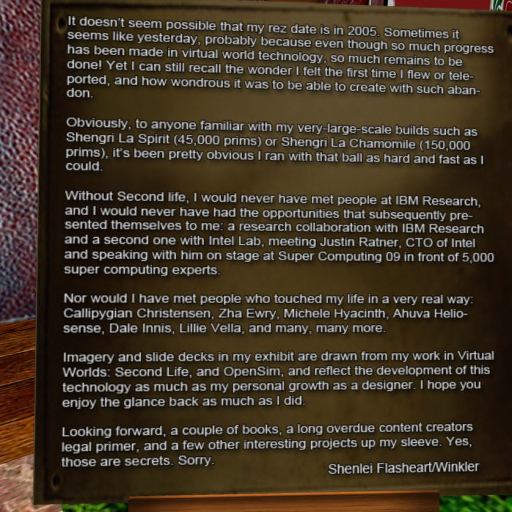 I may not be inworld as much as I used to show up but believe me – SL is in my world all the time. SL has given me many of the “times of my life”.